Life is hard to figure out sometimes. The playing field isn’t always as level as we’d hope it to be and dreams can feel so far out of reach. We try to fit into the areas where we believe we’re supposed to be and things don’t work out, leavin us shattered and confused. Let downs, put downs, left out and empty. What more can you do? You’ve done the best you know how and nothing seems to be getting any better. The circumstances haven’t moved on and the dark rain cloud still hovers over your place. You want to know what I think? Well. I’m going to tell you anyway. I think sometimes we pick out this extravagant puzzle of what we desire our life to be. We scroll past all the options until we reach that beautiful box and say, “Yep. That’s me. This is going to be great!” We tear open the box and get going on putting our life together only to realize half way through that there are pieces missing. Big pieces. Gaping holes with lumpy edges. And we’re stuck. We’ve tried to fill the gaps. We’ve searched our sibling’s toy boxes and under the bed for missing pieces. We’ve searched the back seat, the beverage aisle, and the church. But we still have these jagged holes yet to be filled. Can I tell you something? Take off your steel toe boots and expose those little piggies. Here’s the honest truth. We’re going to continue searching until we realize who holds the pieces in the palm of His hand. We will never be satisfied and fulfilled until we go to Him with our issues that plague us and leave us blind and uncertain. We’ve gotten so good at this game though. We find pieces that have been drenched in sour milk, crusty with peanut butter stains, and torn by little fingers and try to stuff them into holes that don’t fit. The edges don’t line up, but there we are like a 4-year old jabbing random pieces in and getting more frustrated by the minute. Psalm 63:1 says, “Oh God, you are my God, earnestly I seek you; my soul thirsts for you, my body longs for you, in a dry and weary land where there is no water.” See, we were created with a missing piece. The more we try to find satisfaction in other things, the emptier and more weary we find ourselves. He holds the missing pieces in His hand and He is willing to give them to give them to us if we come to Him humbly. He has the remedy for your emptiness. He has the answer to your lingering questions. He has the friend for your loneliness. He has the the joy for your sorrow. You can try everything under the sun but nothing will satisfy you like a living, breathing relationship with your God and Creator and fulfilling His plan for your life. But it’s risky. It involves stepping out of your comfort zone. 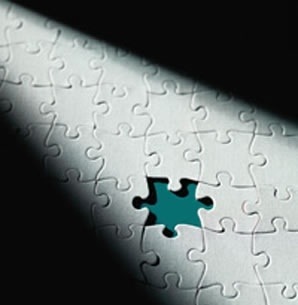 It involves putting the search for the puzzle pieces at the feet of the One who created the puzzle. He knows what’s around the corner and He knows what haunted your dreams yesterday. Are you up for it? I sure hoped you would be. Put the soggy piece down and let God show you what you’ve been searching for all along. I'm just a wife, mom, and daughter of the King! Life Unscripted Ministries is just about living life by letting go of the steering wheel and letting God take control. Lay down your plans and desires at the feet of Jesus and see the amazing things He has for you! Watch Him speak through the little, day-to-day things in such powerful ways! Posted on July 26, 2013, in Uncategorized. Bookmark the permalink. Leave a comment.